Construction has started on the building–sort of that is. Topsoil has been moved aside and fill dirt is being added to the building pad area. Each layer of fill dirt must be compacted so we will have a firm base for the concrete floor. The detention pond has been roughed in with the intake and outlets put in place. An underground drain from the parking lot to the detention pond is complete. The water meter and a new utility pole have been installed. Problems with the sewer line crossing under the city water line have been ironed out. The rainy weather is playing havoc with the building schedule. Wet dirt doesn’t compact properly. Depending on how much rain falls, each time it rains causes a couple or more days of delays. 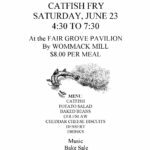 Coming up on Saturday, June 23, the senior center will host the second annual fish fry and bake sale at the the pavilion north of Wommack Mill. Next year, we can use the new building for this purpose. Then we won’t be at the mercy of the weather. 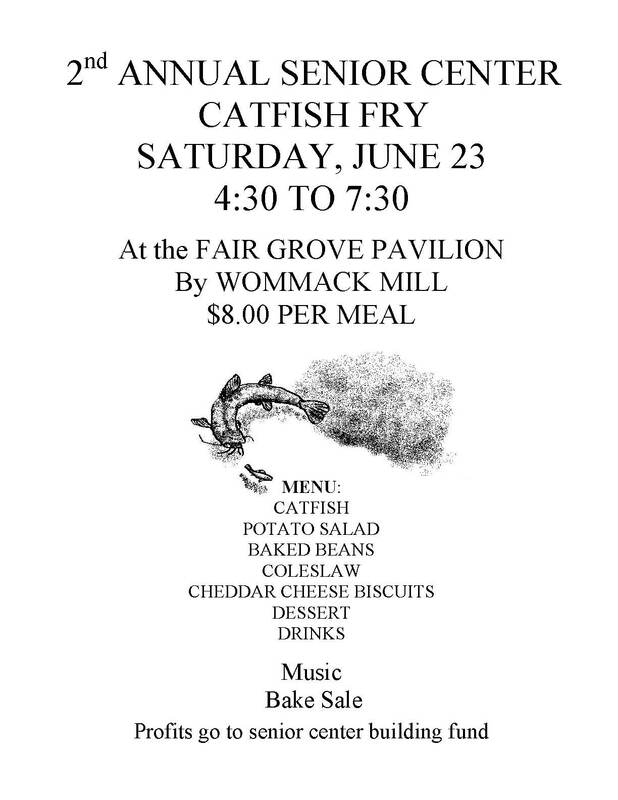 Click on image below to see an enlarged picture of the event flyer. The road that led to this spot and time started around eight years ago when a group of 6 people, including our board president, Leon Beaty, got together and explored the idea of having a senior center in Fair Grove, and so they did. Later, we decided we would try to raise enough money to build a building we could call home. Back then we were too naive to realize there was no way we could possibly do that, so we forged ahead. Over the years the route we took to raise money consisted primarily of raffles, with some other events thrown in. None of us had much experience with raffles. What kind of things could we sell enough tickets for to make a profit? We settled on a pig. In the end, the packing plant donated the pig and the packaging. As I recall, we made close to $1,000 dollars. So we were off on our adventure. Over the years we tried different items with varying degrees of success. We raffled his and hers bicycles. We raffled a big flat screen TV and a gas grill. Dan Waddlington, Roy Blunt’s guy in Springfield, came out and ate with us and suggested we try raffling guns and so we did. O’Bannon Bank agreed to match what we raised that year. That decision allowed us to raise $10,000. We did the guns one more time, but even though we sold all of our tickets, it was a harder sell. There didn’t seem to be any item that had universal appeal. For example, some people love guns while others hate them. After knocking it around a while, we decided to try raffling money. It would be a “Whatever you want raffle.” Winners could take the money and buy whatever with it. This was a risky venture since we had to pay out $2,000 in prize money. We did that for two years in a row. Both years we cleared over $6,000 and both years the $1,000 prize winners donated their winnings back. We raised money with cookouts, pizza parties, silent auctions, fancy dinners, fish fries and paddle parties. We even catered an auction. At the rate we were making money, we would have enough to build this building—not counting inflation—in about 90 years. Clearly that was not going to work. Somewhere along our trip, Dorothy Wittorff-Sandgren from MSU paid us a visit. She told us about some grants that we might be eligible for. In particular, a Neighborhood Assistance Program grant and a Community Development Block Grant. The NAP grant could yield $500,000 and the CDBG could bring us $250,000. Now were talking! The problem here was that we needed to have $50,000 in our building fund to have any hope that we could get those grants and we only had $32,000. Greene County Senior Citizens Service Fund board members sat in at one of our monthly board meetings. After listening to how hard we had been working, they offered us an $18,000 grant opportunity. That gave us the seed money we needed to qualify for those big money grants. We hired Dorothy to be our grant writer and Ireland Architects to do a preliminary plan for the building. We were approved for both grants. The NAP grant is a tax credit program. We had 17 donors and sold out in a little over a month. The CDBG grant had a provision that stated we could not spend any of their $250,000 until we first used $668,000 of ours. $500,000 of that would come from the NAP money and by that time we had about $60,000 in our building fund. Once again GCSCSF came to our rescue and granted us a $100,000. With the money in hand, we went out for bids. To our dismay, when the bids came in, the cost of the building had gone up about $64,000. Even with the money we had earned in the meantime, we were still short by over $40,000. Just over a week ago, GCSCSF granted us that amount and that helps explain the fence that surrounds our property. We signed a contract with Bales Construction Company and they are ready to start moving dirt. As we arrive at this site, we have numerous people and groups to thank. Since the beginning, Fair Grove’s United Methodist Church has provided us a home each Tuesday and we thank the church. The ground we are standing on was donated to us free and clear by Charles and Howard Huff and we thank them. We have no paid employees. We have volunteer cooks—some of them have been with us since the beginning. Others help: serve, clean up, take money at the door, work selling raffle tickets, mowing this property and so on. As volunteers, they receive no money and they have saved us a small fortune over the past years and we thank them. Every raffle ticket we sold or special meal we served required someone to give us money and we thank them all. We have a select group of people who are very good at begging merchants for things of value. Their latest examples are two $1,000 and one $250 Walmart grants we just received. We thank them for their efforts. Bank of Bolivar made us their not-for-profit choice to receive proceeds from their annual campaign to sign up new accounts a couple of years ago. We received $880 from that effort and we thank them. As I mentioned earlier, O’Bannon Bank matched $5,000 with one of our raffles and we thank them. And while we are at it, we thank all those people who donated items—like desserts, handmade crafts and quilts to auction or the four wheeler that we sold for $1,600 and businesses who gave us grants, food, gift cards and merchandise like a refrigerator and ceiling fans. Obviously we need to thank the state and federal government for providing their grants. We are also very grateful to Greene County Senior Citizens Service Fund for their repeated financial aid. Senior Age has given us grants that help cover the cost of meals and we hope they will help us stay solvent in the future. As we symbolically break ground for this building, we have not reached the end of our journey. In fact, we are just heading off in a new direction that should keep us going for many years to come. One that will bring some measure of: physical, emotional, and nutritional comfort to today’s seniors and those that follow them. After we turn a shovel full of dirt, I encourage all of you to walk over to the Lions Club and have some punch and cookies with us. Unless someone has something to add, that concludes our ceremony. Thank you for your attendance. We still need to come up with money to do all the exterior work such as water detention pond, parking lot paving, sidewalks, sewer hookup, and landscaping. We need generous donors like you to help us meet this need. If you can help, see our Donations page and donate to our building fund at CFO or complete and mail the donor form. Both of these options have links highlighted in red. Bales Construction Co. was selected as the contractor for our building project. However, we cannot commence construction until we have the building project fully funded. This means actual money on hand in our building funds and checking accounts or commitments of funds. By my calculations, we are about $40,000 short of the required amount. It is imperative that we quickly find more money or a least commitments to provide this money. After that is out of the way,we need to come up with more money to do all the exterior work such as parking lot paving, sidewalks, water retention pond, sewer hookup, and landscaping.